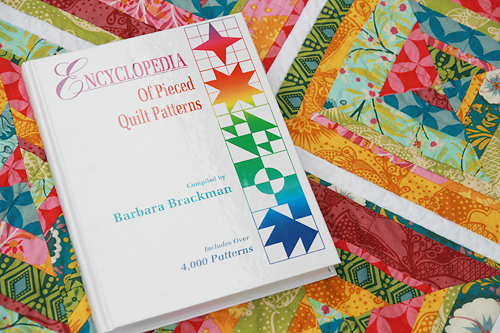 Last week on Flickr there was a discussion about a quilt block that led to the book Encyclopedia Of Pieced Quilt Patterns. Amanda was kind enough to post a photo of the block in question and as soon as I saw the inside of the book, I was *very* interested. This book is really amazing. It is not glamourous. There are no finished quilt photos in front of historical barns. But it is an excellent reference. 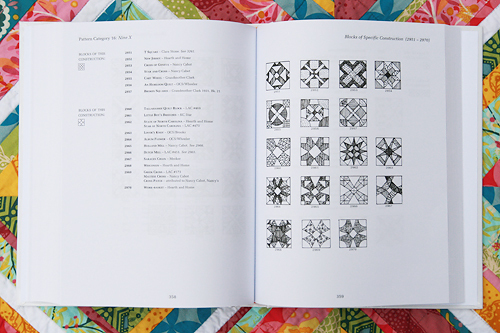 The book is divided into type of quilt block. Each page is as below - quilt blocks sketched on the right, quilt block name and occasionally known origin on the left. There have to be thousands of blocks in this book. It's a good reminder that there are probably no quilt blocks that have not been done before. LOL I love that the book has the name of the blocks so I can just Google the name to find instructions. My mind is racing with ideas to use this book. Maybe pick a block a week to make and walk through it here? Maybe use it for a quilting bee and have everyone pick a block from a page? I'm not sure...but I can't wait to get started with it. I'm also excited to share that my Kaleidoscopic Kites quilt and free pattern are featured today on Quilt Story! Pop on over there and check it out! Quilt Story is a fun blog that features a different quilt each day and it's a great way to learn about fellow bloggers.